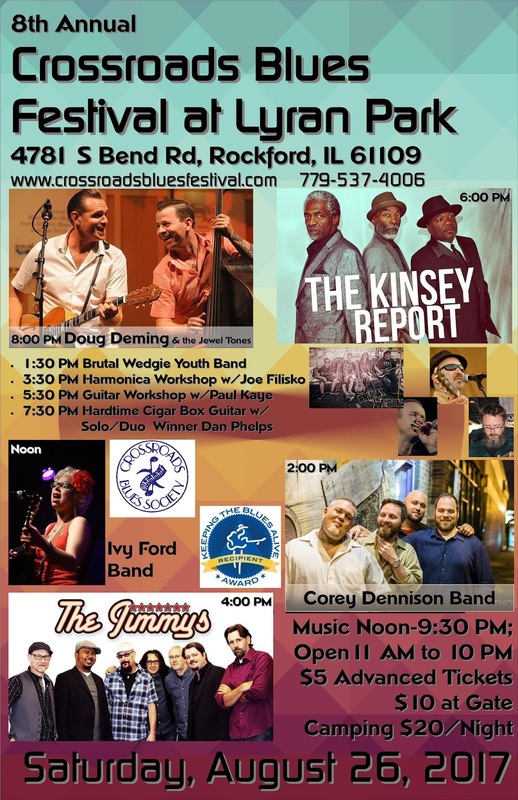 Crossroads Blues Festival: Thank You for Coming to Our 2016 Festival! We Also Preview Our 2017 Festival! Thank You for Coming to Our 2016 Festival! We Also Preview Our 2017 Festival! We had almost 2,500 come out for our event on August 27th! Advanced ticket sales set all-time records! We had a fantastic day, great weather, 29 kinds of beer and wine, superb food, fun merchandise vendors and the best music fans in the world! August 26th 2017 is the date for our 8th Annual Crossroads Blues Festival at Lyran Park. We've got our lineup set and it's another year with a fantastic variety of styles and sounds that will appeal to a broad blues music demographic! Opening the day is the hot young act from north of Chicago- the Ivy Ford Band. Ivy is taking the blues world by storm and we look forward to her opening our fest! She goes on at Noon. 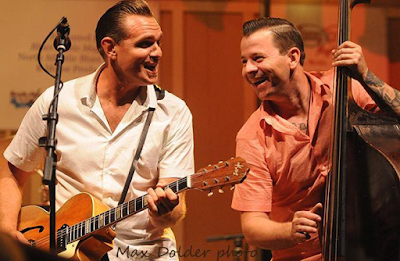 At 2 PM we have one of the hottest acts in the blues world right now is Corey Dennison. He's got his new debut CD on Delmark Records that is flying off shelves. Nominated for a Blues Blast Music Award, it is one of the best CDs of 2016! Corey is a rising star in the blues world and he has a fantastic band featuring Gerry Hundt on guitar, Nik Skilnik on bass and Joel Baer on drums, they are fantastic! Also featured will be the hottest and swinging-est blue band from Wisconsin, The Jimmys! With band leader Jimmy Voegeli on Hammond Organ/ keys/ vocals, Perry Weber on guitar/ vocals, John Wartenweiler on electric and upright bass, Mauro Magellan on drums, Darren Sterud on Trombone/Vocals, Pete Ross on Saxaphones and Mike Boman on Trumpet, you can't find a hotter band than these guys. Well, you can if you add another drummer- none!other than Cheap Trick's Bun E. Carlos! The Jimmys go on at 4 PM. At 6 PM will be none other than the fantastic Kinsey Report! The Kinsey Report Line- Up is Ralph Kinsey on Drums and Vocals, Donald Kinsey on Vocals and Guitar, Ken Kinsey on Bass and Vocals and Andy Ogrodzinski on Guitar. The borthers and Andy are keeping the great music of the blues alive with the band that their Dad started when they were young lads. It's always a great show with the Kinseys- we are looking forward to their return to Rockford! Eastside Detroit native Doug Deming, now hailing from Florida’s Gulf Coast, has garnered widespread attention for his deft guitar work and memorable songwriting. With a nod to the likes of T-Bone Walker and Charlie Christian, as well as Luther Tucker and Robert Jr. Lockwood, Doug leaves his own mark. Doug has spent much of the following years touring and recording with top blues artists, including Fabulous Thunderbirds frontman Kim Wilson, legendary Louisiana swamp bluesman Lazy Lester, Texas' Gary Primich, Chicago greats Johnny “Yard Dog” Jones and A.C. Reed, as well as Detroit’s own Queen of the Blues, Alberta Adams. Leading his band The Jewel Tones, Doug continues to bring noteworthy traditional and original roots music to his audiences. Doug will have a special guest with him- stay tuned to find out who it will be! 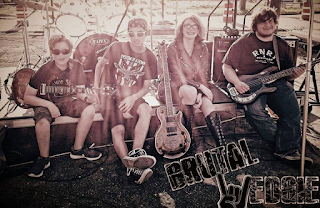 Also performing with be a youth act Brutal Wedgie and Dan Phelps, the winner of our 2016 Crossroads Blues Solo/Duo Challenge who will be representing us in Memphis at the International Blues Challenge. 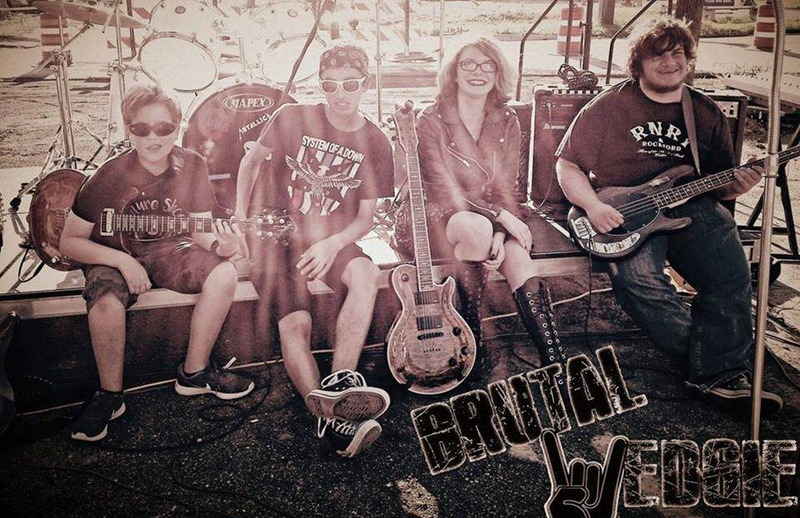 Our youth act Brutal Wedgie goes on at 130 PM in the Pavilion. 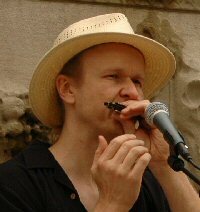 Also in the pavilion, at 330 PM we once again have the great Joe Filisko coming to do our harmonica workshop. At 530 PM we have Paul Kaye coming from the Old Towne School of Music to do a guitar workshop. At 730 PM, Dan Phelps will be playing for us and will have some Hard Times Cigar Box Guitars to demo for us, too! 2017 is going to give us another great festival! Stay tuned for more updates! Birmingham’s St Patrick’s Day Parade 2017 is a major highlight in the city’s annual calendar and there's not long left to wait. And the theme of this year's parade, which will see the city’s streets lined with colourful floats in a huge celebration of all things Irish, will be dance.